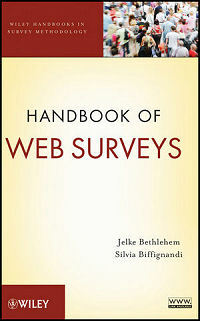 This website is the companion of the book "Handbook of Web Surveys" by Jelke Bethlehem and Silvia Biffignandi. This is a handbook about the theoretical and practical aspects of web surveys. The book Handbook of Web Surveys by Jelke Bethlehem and Silvia Biffignandi describes many different aspects of web surveys. It gives an overview of the theory, but also describes practical implications. Therefore, it can be seen as a handbook for those involved in practical survey research. The book contains the state of the art in the area web survey research. It contains topics not found in other books about web surveys. Examples are an in-depth treatment of undercoverage and selfselection, and an extensive description of various weighting adjustment techniques.